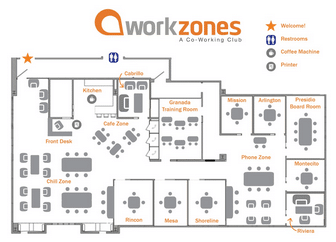 Our first workzones coworking club is conveniently located in the Paseo Nuevo shopping center in downtown Santa Barbara. We’re open Mon-Fri 8 a.m. – 5 p.m. and by appointment only on the weekends and before 8 a.m. or after 5 p.m. weekdays. We’re also available to host special events. Please contact us at (805) 966-3722 for more information. The club is located on the upper level of the Paseo Nuevo shopping center – across from the Metropolitan movie theaters and Foot Locker. The main level entrance faces State Street. After going through the doors, take the stairs or elevator at the end of the hall to the 2nd floor. 75 minute FREE parking is available at the Paseo Nuevo shopping center. The best parking garage entrance is located at 730 Chapala St. near the old Macy’s. 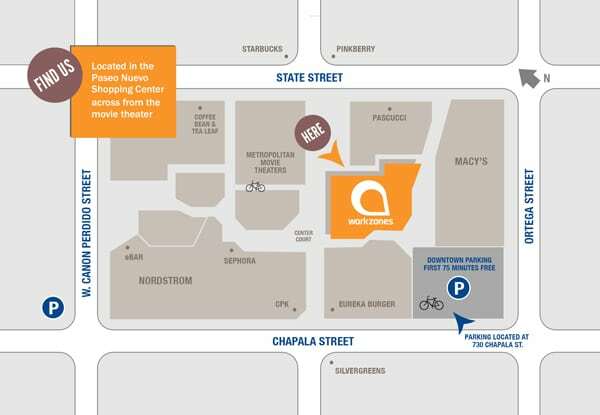 The shopping center is within walking distance of several other downtown parking lots that also offer the first 75 minutes FREE. There are bike storage racks available immediately inside the Paseo Nuevo shopping center parking garage entrance located at 730 Chapala St. Cyclists must provide their own locks. In addition there are racks located throughout the shopping center. Unfortunately, there is no bike storage available inside of the workzones coworking club. Please secure your bicycles prior to arriving at the club.